Just Cause aims to construct and improve classrooms, latrines, furnishings and school grounds to optimize student learning and teaching conditions. All projects are funded through generous donations and fundraising efforts in Canada. Just Cause collaborates with the schools and communities in which they work to determine their infrastructure needs and to determine where the funds are best directed. Local labourers are hired and paid a fair wage. Local materials are sourced so that money is going back into the community in which work is being completed. The Just Cause team designs and drafts all construction plans for new infrastructure including schools, playgrounds, makerspaces, latrines and community buildings. They believe in investing in the local economy and therefore, interview and hire local engineers and labourers to build their projects. All construction materials are also sourced and purchased from local suppliers. Just Cause has had two major projects that they have invested the majority of time and resources towards. Nanso Primary School was a 5 year phased project that was completed in 2017. Nanso is a remote area located on the shore of Lake Victoria. This location was chosen as a project to support after working with the community and observing their commitment to learning. After establishing a relationship with members of the community and the staff at the school, Just Cause was told that this is an area of Uganda that is “forgotten” about by the government. The school includes 8 classrooms, a teacher office space, a 10,000 litre water tank, a playground and a latrine. The school is now directed under the administration of the headmaster and local teachers. School fees support the purchase of school materials. Just Cause visits the school annually to determine if repairs or upgrades are needed. The goal to create this as a locally run school has been achieved. Just Cause now plays a minor role in monitoring their progress from afar and offering support where needed. In 2017, Just Cause began the construction of their second school project, at Our Dad Elementary School. Our Dad is a project that Just Cause began working with early on. Originally, the school was founded to support 11 children that were living in a children’s home and needed an education. 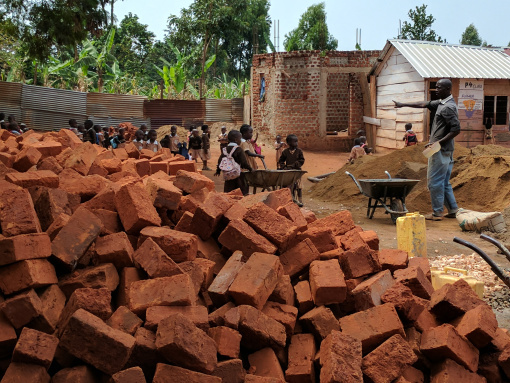 The founder of the home, Michael Zirintu, had a dream to construct his own school in which he could offer an education to children in the Bugembe area. Over the years he raised funds and slowly built up his school. The original 11 students grew to a school population that now serves over 500 local children. Just Cause is inspired by Michael’s commitment to his dream. We have partnered with him to create a permanent school structure on land purchased by the school. The current status of this project is completion of the nursery classroom and near completion of the First Grade Classroom. Once the school is completed, the dream of Just Cause and Our Dad is to work together to build a Tech Centre that will serve the Bugembe area.